The new A1266 from Allegro MicroSystems Europe is a unique 3-dimensional sensor IC incorporating a combination of vertical and traditional planar Hall-effect sensor ICs that can detect a magnetic field of either polarity in any direction. The omnipolar, omnidirectional sensitivity of the new device makes it ideal for detecting magnetic tampering in smart meters, ATMs, gambling/gaming machines, ticket machines and electronic locks. 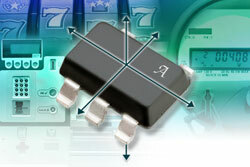 The A1266 can also serve as a general-purpose magnetic switch that is virtually insensitive to magnet orientation or polarity in applications such as games, consumer electronics and white goods. This compact surface-mount SOT23 IC is functionally equivalent to an array of three standard Hall-effect sensors mounted in three different orientations: something that is not possible using a single circuit board and all surface-mount components. With a typical BOP operating point of 25 G, the A1266 has higher sensitivity than most conventional Hall-effect switches, leading to high-sensitivity 3D tamper or proximity sensing in less space with lower assembly cost. Each device integrates, on a single silicon chip, three Hall-voltage generators, a small-signal amplifier, chopper stabilisation, a Schmitt trigger, and one or more NMOS outputs. Allegro’s proprietary dynamic offset cancellation technique means that the magnetic operating characteristics are specified across the operating voltage and temperature ranges. The A1266 is designed for operation in green and battery-powered systems; it can be powered from a 2.5 - 5.0 V supply and the average supply current is typically 7.5 µA at 2.5V. The operating temperature range is -40̊ to +85°C. Two configurations are available: one with a separate output for each sensing direction (X, Y, Z) and one with a combined output (X+Y+Z). Package type LH is a modified SOT23W surface-mount package that is RoHS-compliant and lead (Pb) free (suffix -T), with a 100% matt-tin plated leadframe.